Remember that possum? The one that blared the garage weather radio at 3 am and got into a bag of apples on my deck? Yeah, I forgot about it too. I mean, if you don’t see something, it has to be gone, right? Last night, I walked into the garage, shrieked, then slammed the door. Maybe my cat is wearing a disguise??? LAUGHING!!!! A broom, that’s hilarious. And, actually an accurate description! Ha! Yes!!!!! My cat just stands there! Vinny would chase but not hurt him, and would make a great video! With no food around, they may show up 1 or 2 more times then give up. Hmm…where are those hanging alligator skulls when you need one? Ohhhhhhhh!! Yes!!!! Dang I should have bought them ALL! Hi there. Thank you! 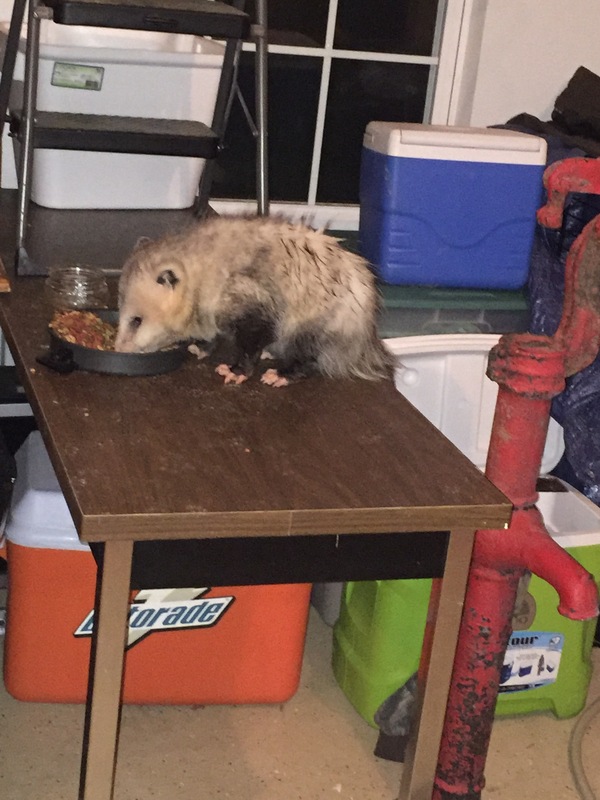 That possum has been around enough it has been the star of 2 other posts. Ha. I could gather that ;) Maybe he wants you to adopt him? Perhaps… The night before we left for vacation, the same sort of incident occurred. I opened the garage door, shrieked, and high tailed it back in. I opened the door and it just sat there, looking at me. That “oh, it’s you” thing. Then, it actually gave itself a lil face wash. Like a bath. I saw a picture on Facebook of someone carrying a possum in a dress. No joke. When I showed it to my husband, we both laughed so hard. Then unanimously said, NO WAY. He’s huge! Love his little peachy pink feet :) Hope he remains friendly and you can safely get him out of the garage! Cute in his own way! :) And, yes me, too. Yikes! That’s scary! You actually got a chance to take a photograph?? I can’t believe the cheek and bravado of it – continuing to eat quite unbothered, probably wondering why you’re disturbing it in its ‘natural’ habitat. How’s it getting in? Do you know? Is there any anti-possum device you can buy? Keep us updated, Jessica. The garage door was up, I’d just been to town and the cat food bowl in the garage was full. We’re keeping the door down now and brought cat food inside. :) The idea is to eliminate food source and it moves on. Fingers double crossed! Yes to both. :) It’s like a mystery game to open the inside house door to the garage! Lucky you! Ha! Well, he’s gone now. Moved on, I guess. :) He was sort of cute, in his own way. Kind of like your lizards!